This is such an interesting debate. Let’s put aside that outdoor advertising is the second-fastest growing medium in the U.S. after Internet advertising, or that Americans continue to have record commutes and spend more time in cars than ever before, or that the outdoor industry now has launched new metrics to improve targeting against different demo groups. I’ll get to the crux: “futility of one-way communication.” There is a huge vibe in advertising circles now that this is bad, it doesn’t work, “we’ve been doing it wrong” — and all this chest-beating is baloney. All the people on ad panels who say this take money from clients with the express intent of influencing others, and one-way communications is primarily how that happens. Of course one-way communication works. The entire premise of advertising is to get people to buy things they don’t need, or at least don’t know they need yet. None of us asked for cameras on cell phones or minivans, yet those products were created and pushed on us with one-way messaging, and we adopted them. There are far too many products in the world, each shoving their way toward us unwanted, and to suggest that one-way messaging doesn’t work neglects the core need of society to push ideas to others. Individuals do this, too, of course. A scan of Twitter shows that the majority of messages are one-way broadcasts — here’s a witty thought, here’s a link, please click to my post, etc. Engagement is a fine idea but the truth is humans are egocentric, get up in the morning thinking about themselves, and spend the vast majority of time trying to influence others. The sneakers you wear and the color of your hair are attempts to tell a story. Your clothes are a one-way attempt to express who you are. You didn’t engage with your audience before making the decision to broadcast those expressions to influence others. You’re pushing it out, one-way. We attempt to influence others with each opening of our mouth, each key on a keyboard, each expression of our being. As far as this being old media, well, yeah, people still drive 2 hours a day past billboards. People also watch 5 hours and 9 minutes a day of TV and read boatloads of content in magazines, PC screens and tablets. The delineation of impressions between “old media” and “new media” is a bit silly when it’s really about consumer modality, most of which is passive receipt of message from distance fields (billboards) or closer fields (laptops). Most people watch a lot. So hat’s off to you, Yammer, for proving one-way communication works. Glad to see the billboard is getting you so much buzz. 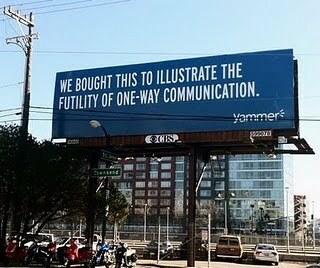 We’re talking about a billboard, so it’s essentially NOT one way communication is it. Also, not only are there too many products vying for our attention, there are too many platforms for talking to each other vying for our attention. This is not an either or. There are some universal truths: consumers don’t want to merely listen, they want to participate; people are spending more time uploading and interacting so by definition they can’t have quite as much time left for listening and absorbing those one way messages; and we do, more and more, tend to appreciate and respond to suggestions and content form peers and personal influencers, so it is wise for a brand to do something that induces some kind of conversation. Billboards, however, remain one of the great media. Because they are so public they become, in a best case scenario (Apple, or anything by TBWA, the masters of outdoor) part of a public dialog. Even if they’re one-way. Finally, as I mentioned at the beginning of this comment, the Yammer board isn’t really one way. It’s the first line of a conversation. P.S. When are you switching to Livefyre? It needn’t be an “either-or” discussion. The key to engaging audiences is finding the proper balance between broadcast messages and conversational messages. You have to listen and receive feedback, but it doesn’t always have to be throught he same medium to count as a conversation. You just need to remember that marketing communication is a cross-channel activity and you have to listen for the response across media. Ben, I’m wondering if nothing is any longer one-way? There are so many opportunities to comment or say what ever is on our mind via Twitter, Flickr, blogs, or FB giving that brand or service a chance to respond. To this point, is it more about brand’s being more exclusive to one-way dialogue by some still lacking participation Vs. the consumer who can now say whatever is on their mind or simply a reaction to what they had seen? Well, if it’s written well, it’s a two-way communication anyway. Right? I mean, when I write outdoor, I’m having a conversation with the reader in order to write the most compelling line. That grabs their attention in 1.5 seconds. I love writing outdoor. But hate the pollution. It’s an interesting debate and reminds me of the debate over the value of Facebook fans and quantity vs. quality/engaged. The overwhelming majority of people don’t interact with brands, myself included. While I like several brands on Facebook, it is in the very rare instance where I would comment on their status post. However, I still like getting the info from the brands I choose to listen to. So while someone like me would be considered a fan with little value in many experts’ eyes, because I don’t interact with the page, the message is still reaching me. Though its not necessarily two-way communication, I’ve given them the permission to reach me where I want to hear from them.